Inter-college Boxing (Men) Championship of Punjabi University Patiala, started here in the local M.M. Modi College Patiala today. College Principal Dr. Khushvinder Kumar inaugurated the tournament. On this occasion he advised the students to remain committed with the sports and opt them for the advancement of their career. He said that their success in the sports is good for the sports person as well as for the country as a whole. College Dean Sports, Dr. Gurdeep Singh welcomed the Chief Guest and other dignitaries from the University and other Colleges as well as the participants of this competition. He specially thanked University Officials Sh. Tarsem Lal Gupta, S. Jaswant Singh, Sh. R. K. Sharma and Dr. Sanjeev Dutta who played the key role in organizing this championship. Prof. Nishan Singh, Head Sports Department told that 32 teams having more than 125 participants will grapple for the title. This competition will conclude on 11th October 2017. On the first day of this Inter-College Competition, Prahlad Singh, Gaurav Duggal, Varinder and Sunny of Multani Mal Modi College won their matches in their respective weight categories. 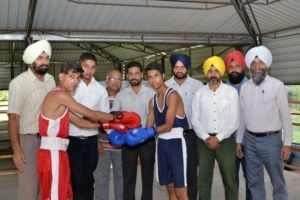 In other bouts, Shubham of NCPE, Chupki, Rohit Kumar of SUS College, Sunam, Rinku Singh and Jagdeep Singh of Desh Bhagat College, Baradwal, Ravinder Singh of University College, Ghanaur and Pankaj Sharma of Govt. Mohindra College, Patiala won in their respective weight categories. On this occasion, Dr. Kewal Krishan, Medical Officer, Prof. Harneet Singh and Prof. Mandeep Kaur were also present. Large number of students and teachers were there to applaud the performance of the pugilists.